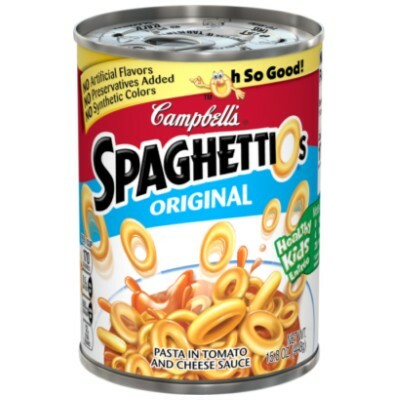 The go-to meal for kids and college students alike, delicious Campbell’s SpaghettiOs are there to take the mess out of eating spaghetti! This American canned soup staple features zillions of fun pasta rings in a savory tomato and cheese soup! The best part? They are ready in minutes- just add heat and you’re ready to enjoy the lip-smacking good taste of SpaghettiOs! Water, tomato puree (water, tomato paste), Enriched pasta (wheat flour, vitamins B3-B1-B2-B9, ferrous sulfate (iron)), high fructose corn syrup, less than 2% of: salt, enzyme modified cheddar cheese (cheddar cheese [cultured milk, salt, enzymes, thickening agent E509], water, stabilizing agent E339ii, enzymes), vegetable oil (corn, canola, and/or soybean), enzyme modified butter, skim milk, acidity regulator E330, paprika extract, onion extract, flavoring. Contains GMO. Nutrition facts (for 100g): calories 67Kcal, total fat 0.4g (saturated fat 0.2g), total carbohydrate 13.9g (sugar 4.4g), protein 2g, salt 0.6g.